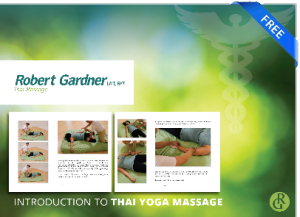 I’ve spent lots of time over the years giving Thai massage and it’s as good for the receiver as much as the giver. As a receiver you get deeper consistent pressure and the range of motion involved in unparalleled. Those aches and pains you get in your back and neck go away and stay away longer than table massage. As someone who gives the work I get a chance to move, breathe, stretch and exert muscles. I burn more calories than giving table massage and have a broader range of motion while using my whole body not just my arms and hands. This full bodied practice reminds me of moving meditation again and again.